Got a CNY pressie from Sasha. Yeah.. got another tag from her. Hmm.. this is a simple tag question yet tough to answer. Been cracking my head since yesterday to come up with 5 reasons… Actually there’s only one reason why I blogged. It’s all because of Ryan, Ryan, Ryan, Ryan and Ryan. So, these 5 reasons below are dedicated to my little monster in hope he would learn to appreciate when he is able to read his mummy’s long winded blog one day..
1) My memory capacity is deteriorating. What to do.. age catching up ma. 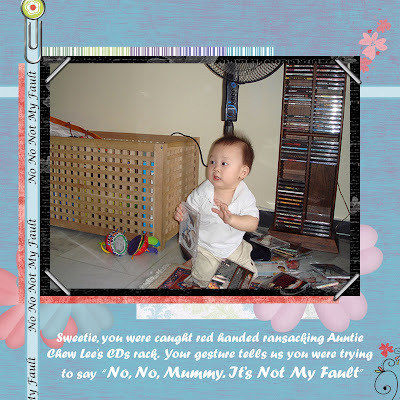 So I hope maintaining this blog will enable the storage of all the memorable moments, memories (sweet and sour) on raising my little monster. I hope blogger has a BCP on their servers…. 2) I hope when Ryan reads the blog about himself one day, he would be able to feel the love we have for him.. you know la.. sometimes it’s very difficult to express our love physically esp when the kids grow. Cannot be all day muaks muaks him, say I love you every single minute. So hopefully, with this he could read and feel the unconditional love that’s surrounding him. 3) Also hope Ryan would learn to appreciate his loved ones (esp mummy.. heehee…)..after knowing how little sleep we get, how many times we woke up a night for his nite nite snackss, how hyper he has been, how he broke mummy’s heart when he crawled to nanny etc etc lor..
5) Aiyoh.. last reason.. erm erm.. really crack head already. Okay la.. final reason is a bit off track but nevermind la.. just wack… By blogging I hope all our family and friends can share, can watch, can be apart of Ryan’s day to day growth. Together we witness Ryan’s growth and development from baby to a handsome man one day…. Update: Managed to find a solution. MIL has been kind enough to help out. So, she’ll take the morning half and me the afternoon shift lor….. Daddy?? Daddy can’t take leave (as expected.. too busy with Project M). Ryan’s sleeping schedule was off a bit today. Instead of the usual 1.5 hours morning nap, he woke up just after half hour into Zzzz-land. On the way to my boss’ open house, I got really worried about his mood knowing he’ll kick up a fuss when he’s sleepy. Then I start my silly calculation on how many hours he can’ survive’ without sleep and what not… However, unexpectedly Ryan fell asleep during the ride. Phew~~. I worried too much. On our way back Ryan had his usual charge of milk. Suddenly he puked without any earlier warning or indication he was full, not well whatsoever. I got really really worried. The last time Ryan puked was when he was down with stomach flu. Thank goodness Ryan showed no symptoms of being ill what not. Again I worried too much. He is as hyper and active as usual. Phew~ Phew~ again. According to the chinese beliefs the 7th day of CNY is considered the birth of human beings (aka everyone’s birthday) so we went out and had dinner at Pek Wah restaurant. The crowd was crazy. So many tables, so many people. I almost thought I’ve just walked into a wedding dinner. The place was havoc, everybody was cheering, talking, laughing… and there was even a karaoke session. Unbelievable..
Ryan was not amused by such a heavy large crowd. It was so difficult to control him. He refused the baby chair, he will straighten his back wanted to come on ground if you ever attempted to stand still at a spot while carrying him, nothing seemed to please him tonight (in fact lately…) Despite bringing Linda with us, I got no peace of dinner. When we got home, Ryan was all smelly and sweaty. So I made water and sponged him straight away. Ryan doesn’t like to have anything on his head. Below is a typical scene when we failed to remove the shirt from his head fast enough. My cute half naked baby just before sponging *pst.. pst.. look like little buddha hor* Heehee..
At night hubs god bro came to pai nin (visiting). So again I have Ryan all by myself, which is good but sometimes it is quite tiring especially when Ryan kicks up a fuss and I have no extra pair of eyes or hands to help out. Lately I donno if it was my bad parenting, Ryan has been giving a lot of challenge to his mummy when it comes to bed time. He will be Zzz-ing off one min, next he’ll be twisting, turning and rolled over to the magic gap, all alert with his eyes wide open. I know he is tired as he is constantly rubbing his eyes yet he just can’t settled himself down. Poor baby. And for the last few days it happened a few nights (erm morning) whereby Ryan would wake up ard 5am and start his usual twisting, tossing, playing at the magic gap, climbing up the bed board etc etc… It’ll be an hour at least before he is tired enough to go back to sleep. If this pattern continues after the CNY break, mummy will faint. Yesterday we paid a visit to Malaika’s Mummy. Ryan’s “kai ma” Elaine came and picked me and baby Ryan up. Thanks Elaine!! It was such a joyous occassion. The last time they saw Ryan was when Ryan was barely 4 months I think. Chong chi agessssss ago. Ryan had a lot of fun (I believe) as he was very busy with Malaika and Malaika’s toys. Really made himself feel at home. Sorry Malaika’s Mummy.. you have to clear up the mess after we left. Love the pic below. How lovey dovey..
Ps: I realised I do not have any pics of myself and Ryan. Too busy taking pics. Kekeke.. we had soooooo much fun.